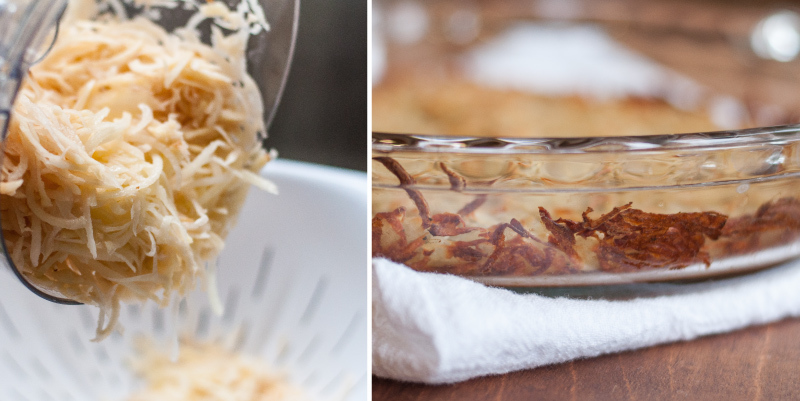 March 2015 update: The recipe has been simplified to make it much more quick, namely without 40 minutes to pre-bake the crust or over an hour to caramelize the onions. See the recipe below for the complete update! The theme of this week is things made in a pie plate. S’mores pie. Cheesy tarts. 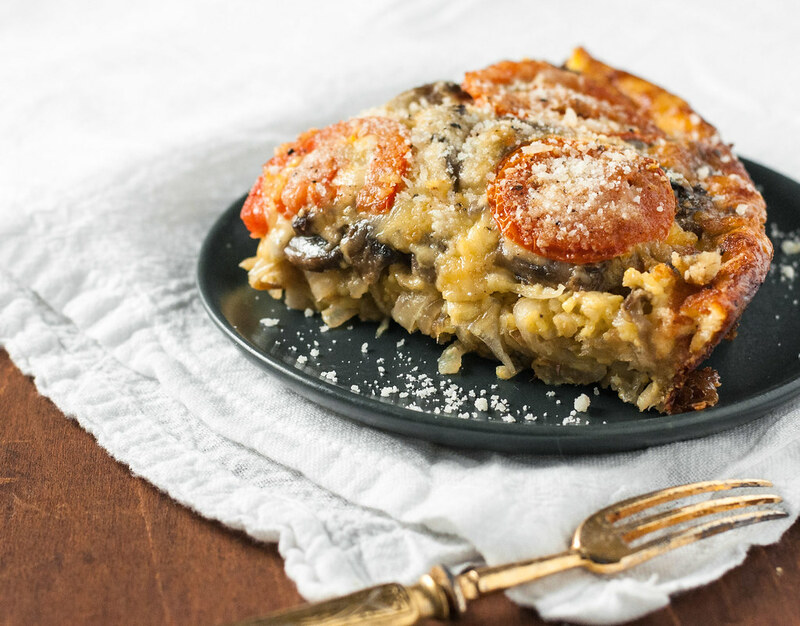 Spaghetti [squash] pie! Well, the last one would have overflowed a pie plate. Maybe on the re-test I’ll take out one of the fried zucchini layers? Or not. Regardless, I guess I’ll just have to make it again ASAP, seeing as I watched it disappear before my very eyes. Things that happen when dinner is a half hour late, my parents/diners just rode their bike (not a grammatical error–one single tandem bicycle) 30 miles, and they’re not accustomed to eating an entirely veg-based dinner. Oopsies/on purpose. 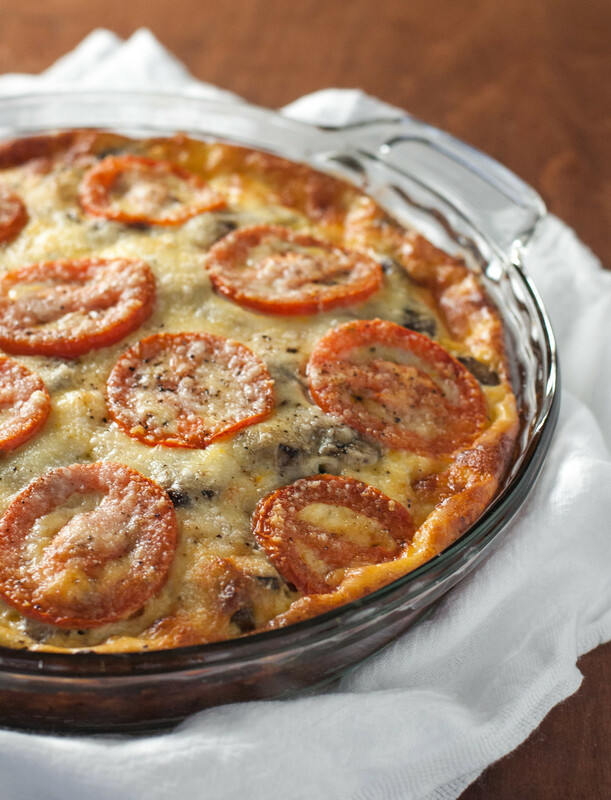 Let’s get to this savory tart, though. It’s gluten-free, thanks to an incredibly simple (and cheap) potato crust, which is more like a hash brown. The crust is partly baked before adding the filling, so the potatoes have plenty of time to cook through without infiltrating the tart filling with water. Thanks to a generous layer of butter or olive oil in the bottom of the pan, they turn a nice crispy golden brown, too! I’m resisting the urge right now to insert multiple Food Network references to brown food or Flavortown. 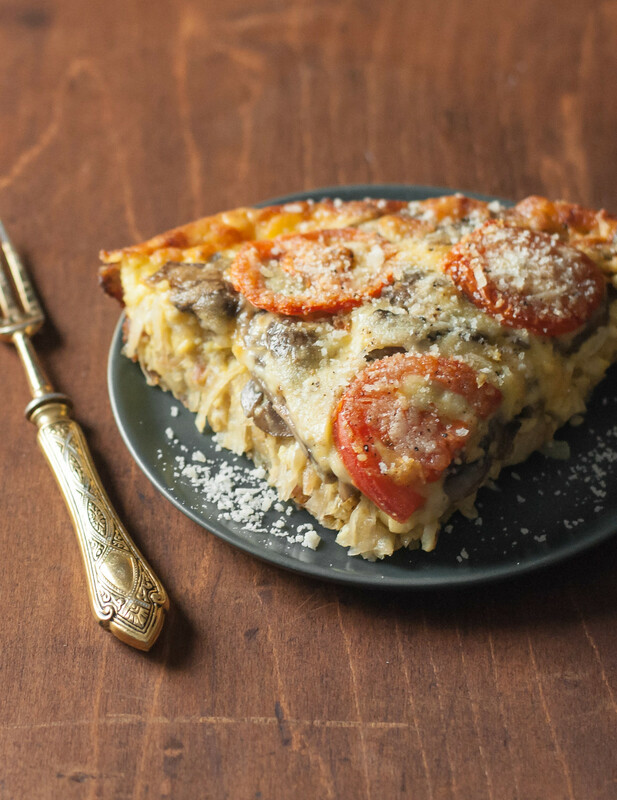 You literally won’t even miss meat given the sweet, salty, tangy, creamy goodness that rests atop the crust. Dijon mustard, sauteed mushrooms, so much cheese, and eggs to hold it all together. So you have gluten-free, meat-free, protein, vegetables, and…calcium? Yeah, I just thought of the calcium thing and I wouldn’t tout it as a health benefit of this meal, but I suppose if you need convincing you can use that as your justification. 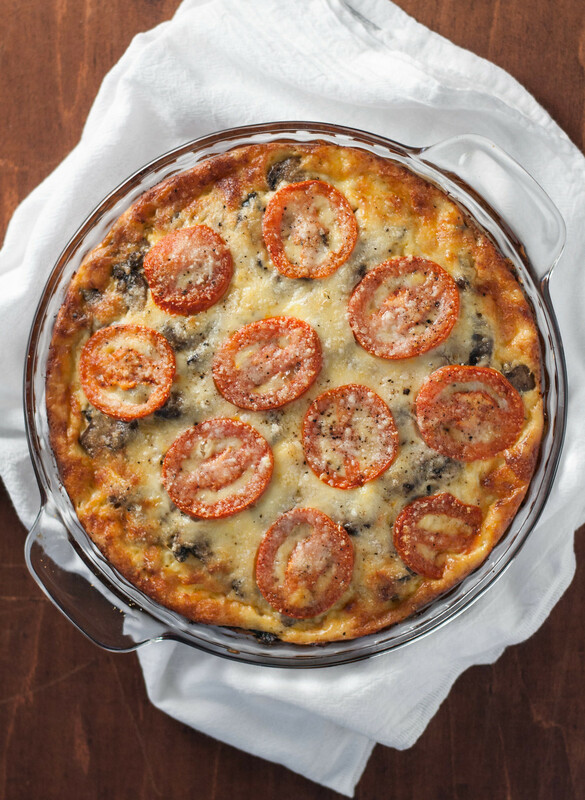 Serve this as breakfast, brunch, lunch, dinner, or even a side dish. Serve it with a salad or a roast chicken or fresh fruit. Piping hot or warmed in the oven. Make it ahead and refrigerate it for a night or two, or freeze it for a week or two, wrapped it foil. Basically, do whatever it takes to get this tart to your mouth, and it will not protest its treatment by diminishing in deliciousness. A forgiving tart? If that doesn’t convince you, then I really have nothing for you. 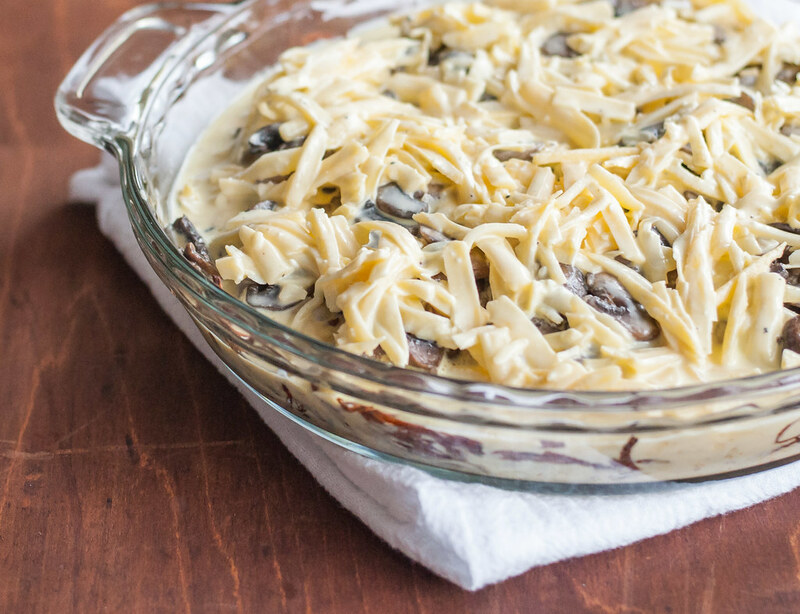 If you’re feeding a crowd with this dish as the centerpiece, I recommend at least doubling the recipe and preparing it in a 9×13 pan or a larger casserole. A quickly browned sweet onion stands in for a slowly caramelized onion, but if you have extra time or some caramelized onions around, feel free to go with the "real" thing. Take mascarpone, milk, and eggs out of the refrigerator and set aside. Preheat oven to 425 degrees (F) and position rack near the bottom. Place potato in a colander in the sink, toss with ¼ teaspoon each salt and pepper, and press down on them with your hands to remove most excess moisture. Spread in a standard (about 9") pie pan greased on the bottom with 1½ tablespoons butter or oil. Press down to form a crust on the bottom only and bake about 15 minutes, until the edge of the crust starts to brown. Reduce oven temp to 375 and position rack in middle. Meanwhile, heat 1½ tablespoons butter or oil in a 10 inch skillet over medium high. Add onion and cook, stirring frequently, until golden in most places. It should sizzle loudly as it cooks for about 10 minutes, if the burner is hot enough. Remove to a medium mixing bowl. Heat remaining (2 tablespoons) butter or oil in the same skillet over medium. Add mushrooms and sauté, stirring infrequently, until they brown and the released liquid evaporates, about 10 more minutes. Add to bowl with onion and season with ½ teaspoon salt and ¼ teaspoon pepper. Brush baked crust with dijon. Top with mushroom/onion mixture almost to the edge. Wipe clean the bowl from the vegetables, then add mascarpone, milk, eggs, and ¼ teaspoon each salt and pepper, and whisk until smooth. Stir in fontina. Pour over the tart, gently spreading out the fontina if it piles in the center. Top with a pinch of dried thyme or tomato slices, followed by a layer of parmesan, if using. Place tart on a rimmed baking sheet and cook about 30 minutes, until nearly set but slightly soft in the middle. If you’re using a different pan size, such as for a double recipe, check the tart earlier and be prepared for less or more cook time. Allow to cool before serving so the tart can set up more, making it easier to slice. Nutrition: Gluten-free; vegetarian if parmesan is omitted or vegetarian and mascarpone or fontina are vegetarian. Other soft cheeses may be substituted, in equal volume, for the fontina. I've used up to 16 oz. 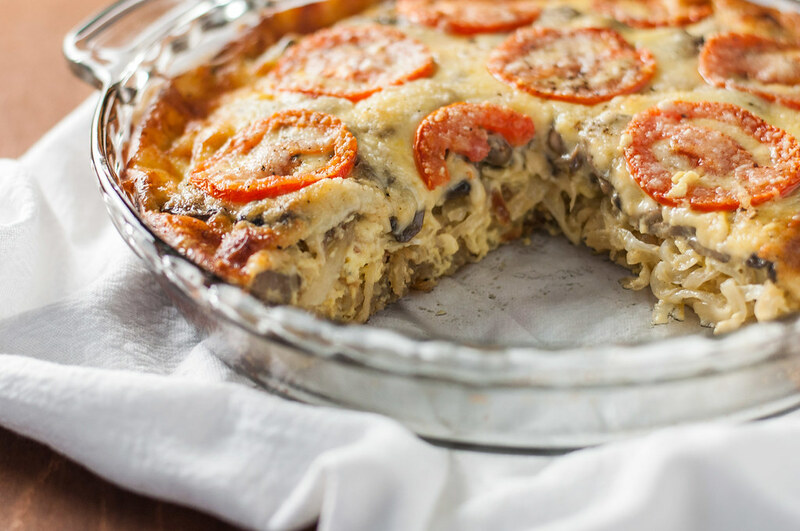 of mushrooms, which produces a bulkier tart, but works fine with the same amount of egg/cheese mixture. If you're really hungry and serving the tart with only a light or no side, it may only feed 4. If serving as one of many brunch options or a side dish, it could serve up to 8. Note: This page contains affiliate links. It does NOT contain sponsored content. 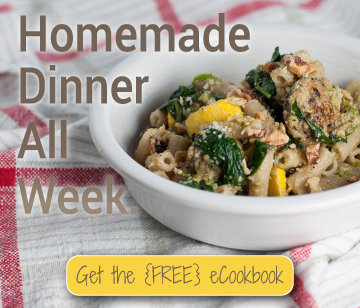 Affiliate links (to products I recommend, on Amazon) offset my ingredient and website maintenance costs, so I can keep bringing you delightful recipes like this one. Thanks!